Patti - thanks ever so for the report - can't wait to see him later this month over here. I wondered if you might get to hear 'Vertigo' the co-write with Antje, from her new CD - a lovely haunting song. Sorry to hear about the (continuing) snow - I think that I too would be fed up with it if it had gone on for so long. Well Jela I am happy that Mark is making it to UK but just looking at the dates again I wish it was a few days later as Antje will be having her CD release shows at Passim's at the same time, and I think it would have been possible that Mark showed up for them at some time. Also, if it was a day or two later, you would be rested after SXSW!! Here's Jela's review of Mark's show at Patti's Place on Jan. 1, 2009 which was published in the most recent issue of Maverick magazine. Nicely written Jela, I sent links to lots of my friends. Richard provides the photos.. what a team !! Sugarland happens to be on the cover of this issue..
Mark's main website seems to be down.....wonder if he knows -- myspace still works!! I'm pretty sure she is enroute from SXSW to England now to get back and catch Mark's performance Monday night!! Well his website is still not responding to clicking the link at google....but fear not!!! Here's a lil something to look at til he's back on the line. What's next, the Ellis Paulo shirt? Yes - got back from SXSW yesterday lunchtime and went to see Mark in the evening. I will post later about the show but just letting you know that the website is down because the 5 yr domain name has expired and Mark can't remember his password. He will sort it out when he gets home and it should be up and running by the end of the week. Lots to tell you about his visit. Catch you all later. I will also post about SXSW. Mark Erelli opens for Josh Ritter Sunday March 29 at Diesel on the south side of pittsburgh........hmmmmm. paddyinthepub wrote: Mark Erelli opens for Josh Ritter Sunday March 29 at Diesel on the south side of pittsburgh........hmmmmm. Great show - he's coming back in August, for Shrewsbury Folk Fest, the Green Note London and hopefully a few other dates. The Darwin Song Project was a great success and will be featured on BBC Radio 4 tomorrow morning at 11.00 am (7.00 am Boston time) and I’ll be listening in. There will also be a CD release. I get to see him again in July at WoodyFest and in August back over here - Woo Hoo! So glad you made it back to the UK in time to catch Mark! Thanks for the wonderful report and the link to the article. (I love that picture of Mark used in the article.) I'll try to get a few pictures this Sunday night and will be sure to post a report as well. I was not able to get any pictures. Mark's show in Chicago (Berwyn), Saturday night (Apr. 18, 2009) was a wonderful house concert setting at This Old House Concerts. It was good to see Dean & Elaine! It sounds like this made up for the last venue that you went to for Mark. bonuela wrote: It sounds like this made up for the last venue that you went to for Mark. Thanks for the review, Karen......some roadtrip. Thanks for the report and photo - that's started my morning off very nicely thank you! What a nice set of songs, I love that new one 'Columbus, Ohio' and the Darwin Song 'Kingdom Come' is being hailed as one of the best from that project, by people who went to the full concert and heard all the songs. I knew you'd like that photo.....and I did remember to pass your regards on to Mark. Richard + Jela wrote: Thanks for the report and photo - that's started my morning off very nicely thank you! Josh Ritter and Mark Erelli perform Roll On unplugged at the Sellersville Theatre in Sellersville, Pa. Thanks Paddy - very nice. Love both guys, a double bill to die for! 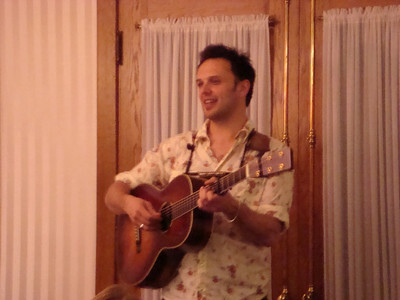 Member Concert from June 2004 featuring local singer-songwriter Mark Erelli on WUMB Friday - May 22, 2009 - 5am EST. This should be a perfect time for Mark's #1 fan in England! Ha Ha - Friday morning I'll be tuning in to as much of it as I can, I'll miss the beginning but should catch it from 25mins in - thanks for thinking of me. The River Sound Cafe brings you in studio with Mark Erelli. This is wonderful! Thank you Paddy for posting it. I must be slipping as I hadn't come across it before and it's been up since 9th May! Shame on me! thanks for the link Paddy, and I'm sure Mark appreciates it too. Check out what he has to say in his latest newsletter below!! He wants pictures!! Richard and Monica I KNOW you have a couple of great ones.. WEB UPDATES: I get so wrapped in making music I sometimes forget to actually let you know about it! To that end, I've updated a few parts of my website. My discography contains some new entries and while it's far from an exhaustive list of my guest appearances on others' records any means, it's getting more complete. I also added a section for pictures taken by fans. If you have a good picture of me (and I'll be the judge of that!) that you'd like to see on the site, send it to me at mark@markerelli.com. Lastly, there have been some newly added YouTube videos, including one of myself and Josh Ritter performing his encore unamplified at the edge of the stage a couple months ago. Just go to YouTube, search my name and you'll find it. Mark Erelli performs Once at the Hat Trick Concert Series. When I first heard this song (I think it was during an interview Mark did which was a podcast) I was convinced that it was a co-write with Ron Sexsmith as I knew that he'd written a song with him - I was wrong but it definitely sounds like a Ron Sexsmith influenced song to me. Yes I do like Ron Sexsmith as well! Isn't this the song Mark says he wrote in a big areana shower room bathroom when he was on tour with Lori and Faith & Tim.. !! He liked the way it echoed off the walls.. Yes I think it is that one Patti. For those of you who don't receive Mark's newsletter, the Darwin Song Project CD is available online at Fish Records. You can also watch a video of one of Mark's song from the project - "Mother of Mysteries" - on YouTube and/or watch a video interview at Spiral Earth. Great stuff - the CD arrived in the post yesterday - -haven't had a chance to listen yet but have seen the YouTube videos. Best of all tho' Mark is going to be at WoodyFest! That's a wonderful line up Patti - have a great time. I'm listening to Jake Armerding right now performing live on WUMB....and he just made some very complimentary statements about Mark Erelli. Evidentally Mark is playing with Jake this weekend....and Jake said he gets Mark whenever he can. ..he has good taste then doesn't he? Richard + Jela wrote: ..he has good taste then doesn't he? Mark is in the UK this weekend and performing at Shrewsbury Folk Festival (solo on Friday and with the Darwin Song Project on Saturday) as well as a London date on Sunday at Green Note. The festival, for the first time ever are going to be streaming main stage performances live across the Internet and across the globe. I am so pleased that Mark's solo set tomorrow at 20.45 our time and 15.45 EST your time is being filmed so you can watch it too. We are not going to the festival but are going to the London show. Weekend is lookin' good! Have just finished watching the Internet stream of Mark's set at Shrewsbury and it was just great! He played 11 songs and seemed to go down really well with the crowd. It's great exposure for him and hopefully he's made lots of new fans from this appearance. Great show last night at Green Note, London. Nice crowd including extended family members. Played two sets, about an hour and half in total. He came over to our table briefly before the show and asked if we had any requests. 17. Here at the Right Time (Josh Ritter song - getting in practice for the forthcoming UK tour in Josh's band, supporting Ray LaMontagne. Josh is doing a few shows of his own as well so I'm hoping that when we see them in Brighton (sold-out) on September 15th, Mark is the opener - fingers crossed!). More good news - Mark looks like coming back to the UK in the Spring and is going to be working on a new CD soon. ..now you know how I feel when you guys in the US get to see my favourites on your doorsteps! In my other life, I'd be permanently camped out at Passim and the Cactus Cafe in Austin. Taylor has the show on DVR, so it probably aired in the last week, but she says she will get all the details of its original airing and if the song was in the original BBC show. I guess they have a few versions of the show..it will air again this Saturday 4-5 pm on BBC America, the song is about 50 minutes into the show..
Imaginary Wars @ Patti's Place !! Mark will appear on WUMB's Live at Noon this Friday, Oct. 16, 2009 at 12pm EST!